What Is Race To Space & How Does It Challenge Kids? 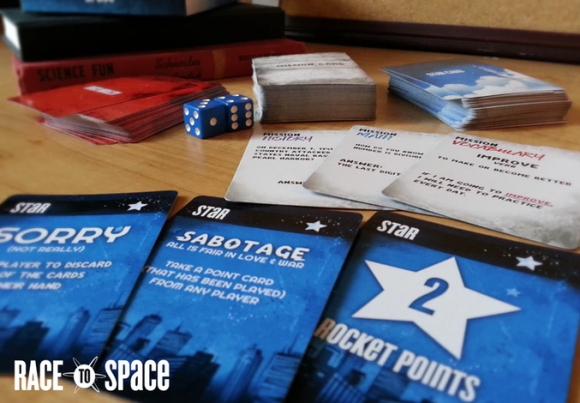 In Race to Space, players embark on an epic battle of wits earning points and game advantages by completing mission quests. Avoid treacherous sabotages, swaps, steals and other shenanigans while navigating through mini games such as Rock-Paper-Scissors duels, instant win chances, and dice challenges. Blast off with this Space Age game designed to re-define learning as an out of this world experience! Finally, a game for kids who wish learning was fun! Playing Race To Space engages kids in higher level thinking in the context of a fun yet educational strategy game. It takes more than luck to master this peer-to-peer card game. Kids must use: reasoning, judgement, strategic planning, problem solving, and communication skills. Which strategy will win? That depends on your competition! Play this game over and over for hours of classroom or family fun. Got this game for my grandkids for Christmas (they are in middle school). They absolutely loved it. As a teacher (retired), I wish I would have had this in my classroom 6 years ago. The kids were playing together and having fun. This is a game that they can play over and over. All the Math was pretty challenging and mostly word problems. The components were nice and seemed high-end. The only thing that was quirky was that the dice are hard to remove from the plastic tray. but other than that I was happy I made the investment. 5 stars. 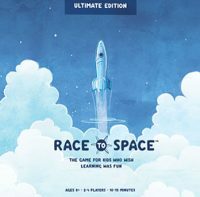 Add a Review for "Race To Space: Ultimate Edition"